Greyston Bakery bakes up award winning desserts AND social change under one roof! These luscious, moist and chewy brownies are made with pure, simple ingredients to give you the best vegan goodness in every bite. Perfect for dessert, snacking, taking on hikes, filling hunger between classes, or any time, if you're a vegan brownie fan of any kind, these will definitely rank high on your list of favorites after giving them a try! Comprised entirely of people offered a job opportunity through Open Hiring, the Greyston Bakery staff operates a world-class food processing facility that changes lives every day by giving opportunities for employment to many people who otherwise may have been excluded from the mainstream workforce. With every brownie purchased, you're helping ensure that those who want to work but who may have had struggles in the past are not denied the opportunity to be employed. 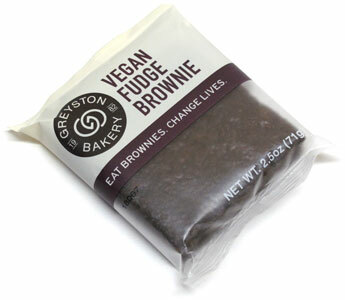 Greyston Vegan Fudge Brownies are 2.5 oz. (71g), and are $2.39 each. From Shayla WILLIAMS of Norwalk, Connecticut on 1/31/2019 . I ABSOLUTELY LOVED THESE BROWNIES...DEF A FIX FOR MY SWEET TOOTH!!!! From Anonymous of Dallas , Texas on 12/13/2018 . Outstanding! The taste and texture is fabulous. You would never know they are vegan - absolutely wonderful! From Anonymous of Germantown, Maryland on 9/8/2018 . These brownies are very rich and have a great texture. I will definitely order again! From Anonymous of Oswego , Illinois on 5/30/2018 . Allergens Contains wheat. Made in a facility that also processes tree nuts, peanuts, soy, milk and eggs in other items.